The construction of "LIFE: The Great Challenge"
Soon after P.J. and I met we found that we both liked to build puzzles. We would spend the day putting together 500 or 1000 piece puzzles. I always wanted to find a large puzzle that would be big enough that you could hang it on the wall and display like art. After searching around all I could find were a few 3000 piece puzzles. But the dimensions weren't big enough for me. I wanted something that would be measured in feet (not inches). Not long after moving to Sacramento, we stumbled upon a puzzle shop and found they had a 6000 piece puzzle. I couldn't believe what I was seeing and bought it immediately. Needless to say we became very frequent visitors to that puzzle shop. We picked up a few more 5000, 6000, and 7500 piece puzzles over the next year or so. Then one day when stopping in to see what they had new I noticed a box that had more numbers than I was prepared to accept - 12000 pieces. I couldn't buy the puzzle fast enough. I found out that the puzzle had four previous owners prior to me buying it. The puzzle shop sold it originally, then it was sold between private buyers two more times until it was finally sold back to the puzzle shop. The box was not shrink wrapped but all the bags for the different sections were still intact so was confident that I wasn't missing any pieces. In fact, out of all the puzzles we have assembled over the years, we have never lost or were missing a piece. Although, unknown to us, our 5 year old daughter once took a puzzle piece to pre-school with her to show her teacher. She never brought it home. We found out later what happened and I ended up making a new piece from scratch with a color photocopy of the surrounding pieces. Fortunately it was in a section of the puzzle where the colors were solid. 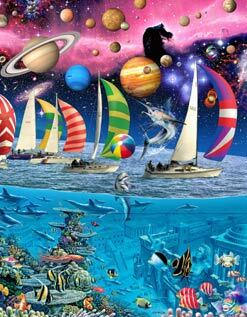 Since then we have been finding and buying our puzzles online or through puzzle magazines. We've finished several 8000 and 9000 piece puzzles. 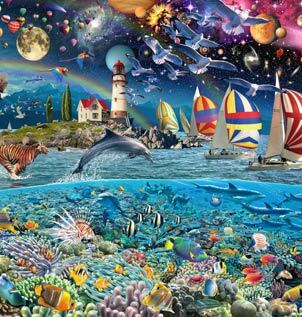 Within the last couple of years we've completed two 13200 piece puzzles and two 18000 piece puzzles. 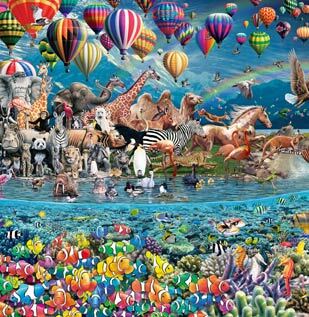 Those 18000 piece puzzles were the previous largest puzzles in the world prior to "Life". Over the years we have come up of with many techniques and tricks to assembling large piece count puzzles. These techniques can be used on all puzzles, not just the "Life" puzzle. First, once the puzzle size gets above 6000 pieces the puzzle typically comes out of the box in sections in separate bags. The number of sections varies from 2 to 6 and depends on the size and manufacturer. One trick that we use is that each section is an exact copy of the others with regards to the shape of the pieces. This means that you can build the subsequent sections on top of the previous ones and know exactly what shape of piece you need to look for. You'll see that in the pictures below. Another trick is that each section has repeating patterns both vertically and horizontally. The sections of the "Life" puzzle have 6 repeats (2 horizontally, every 37 pieces, and 3 vertically, every 27 pieces). In other words, if you took a piece from the lower left part of a section, you would find that exact same piece "shape" 37 pieces over to the right and you would find that exact same piece above 2 more times every 27 pieces. You'll have to complete the first section in order to determine what the repeating patterns are. Some are fairly complex so you may have to hunt for them. The "Life" puzzle's pattern was very straight forward. One of the primary techniques we use when putting together large piece count puzzles is to organize the pieces by color and shape. Most puzzles have a definite number of distinct shapes. Here are some examples of the most common. Most puzzles are made up of most of these shapes. Some puzzles even have variations on the same shape that help you to determine the orientation of the piece with the puzzle. For example, this piece and this piece are basically the same but you'll notice that one is skinnier and the other is fatter. You'll find that all the skinny pieces will go into the puzzle vertically and the fat pieces will go in horizontally (or vice versa). The "Life" puzzle uses the following 4 basic shapes. Each of these 4 shapes have alternate versions that are rotated so that the piece is always in a "tall" vertical orientation. All of the pieces in the "Life" puzzle go into the puzzle is this tall vertical orientation. Although the piece might be rotated 180 degrees. There are a few "odd" shaped pieces like these but not too many. The first thing we do is sort all the pieces by color (or picture element) into Tupperware containers. When we work on a section of the puzzle we'll grab a container and then sort them into these 8 shapes and organize the pieces on a table so that all the pieces are lined up according to the shape and orientation they go into the puzzle. This way, once we know what shape the piece is, we can eliminate a large percentage of the pieces we have to look through. You will not believe how much time this saves! The puzzle measures 428cm x 157cm (4.28m x 1.57m) or 168.5in x 61.8in (14' .5" x 5' 1.8"). We purchased the puzzle from Bits and Pieces. We received the puzzle in early May and started construction on Mother's Day (May 13th, 2007) and finished it on June 16th, 2007. It took us 34 days!! Working primarily after work and weekends, it took us approx 400 man hours to complete. That's 200 hours for each of us. During the week I would typically work from around 7pm until 2am and my wife would typically work from 9pm until 2am. On the weekends I was usually not home most of the day so I only got a couple hours each day but my wife would usually spend most the entire day. We completed section 1 in 12 days. The first section always takes the longest because you don't know the repeating patterns or the exact shape of each piece yet. Section 2 took us 6 days, section 3 and 4 each took 8 days. Notice how much less time each of the remaining sections took. That was due to the fact that we could build on top of the previous section and know exactly which shape piece we needed. Another great website for construction tips is Jigsaw Jungle. Check it out. They are also building the "Life" puzzle. Section 1 - These pictures were taken as a sort of time lapse with a picture taken at the end of each day. 12 days to complete. Section 2 - 6 days to complete. Look closely and you'll see that it is being built on top of section 1. See how the pieces are exactly the same as the section underneath. This is key to getting the puzzle done quickly. Section 3 - 8 days to complete. Look closely and you'll see that the top of section 3 is being built on the bottom of section 2. The section duplication was flipped 180 degrees. We haven't organized the starry sky yet. We're making progress on the bottom half. You can see a little bit of section 2 still showing underneath. Section 4 - 8 days to complete. We tried a new technique. We took a rubbing of the completed section underneath. This allowed us to work on a part without having to build it in the puzzle but still know what shape we were looking for. Notice some of the planets are just floating out in the middle and not connected to anything else. We know exactly where they go because of the section underneath. This is what we had left to finish before we started working on the last day. We ended up going until about 2:45am the following morning. That's about 900 pieces in approx 9 hours. Notice the pairs of pieces that weren't broken apart out of the bag that we could place into the puzzle where they go simply by shape. Building on top of the previous section sure does help! The Completed Puzzle - 34 days total completion time. Had to split the sections in half to make it easier. We put contact paper on the back of each section to hold it together and use a rolling pin to press it onto the pieces really well. We had to clear out our room to be able to fit it all together. Notice the sections of a 13500 and 18000 piece puzzle on the floor that haven't been mounted yet. Lay all the sections face down and connect them all together on a flat surface. We used our garage floor. Peel off the contact paper that was put on the back of each section when it was completed. Re-apply new contact paper to the back of the puzzle as a whole. Using a spray contact cement, glue sheets of foam board to the back. We used three 4'x8' sheets. Using a very sharp razor blade, trim off the excess foam board around the edges. Get some help to hold the puzzle on the wall and then nail it up. Other puzzles we have built over the years - Not pictured are many 5000 and smaller puzzles. At only 5000 pieces, this was the hardest puzzle we have done. Reason: 4 pieces do not make a square. Lines are not straight. This was the first large puzzle my wife and I did. Still in sections waiting to be mounted. Of all the puzzles that we have built over the years this one is by far the most memorable. Not just because it is the largest but more for the challenge we set for ourselves to complete the puzzle in 6 weeks. Last year we completed the 13200 piece "Lahaina Vision" puzzle in 3.5 weeks. I figured that we should be able to do this one in 6 weeks since it's not quite double the other. I'd say that we definitely beat our goal. Before we started I decided I wanted to document the build in a time lapse by taking a picture at the end of each day. I didn't realize that after section 1 was completed that the time lapse idea was not going to work any longer because you would never be able to clearly see the changes from day to day since we built the sections on top of one another. It wasn't until we were part way through section 2 that I came across the WorldsLargestPuzzle.com website and learned about the challenge they were proposing. The idea that we might have a chance to be the first to complete the puzzle definitely provided motivation. Not that we needed much more. PS... Checkout our new puzzle website at slaterpuzzles.blogspot.com. We will be posting new info on all the new puzzles we are building over there.